152 pages | 22 B/W Illus. Miscanthus has been enthusiastically promoted as a second generation biomass crop, and this book provides a comprehensive review of this knowledge. Miscanthus, also known as elephant grass, is a high yielding grass crop that grows over three metres tall, resembles bamboo and produces a crop every year without the need for replanting or fertiliser application . The rapid growth, low mineral content, and high biomass yield of Miscanthus increasingly make it a favourite choice as a biofuel, outperforming switchgrass and other alternatives. There is over twenty years of research evidence to support its promotion as a second generation biomass crop. The author reviews many field measurements of yields as well as the physiology of the crop, and why it is so productive while at the same time requiring low inputs to grow it. 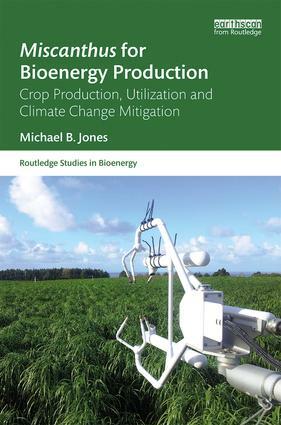 It also shows how as a key biofuel crop it can contribute to mitigating climate change and how uptake of the adoption of Miscanthus production can be promoted, particularly in Europe and North America. The book will be key reading for students taking courses in the areas of Environmental Science and Engineering, Climate change Impacts, Renewable Energy and Energy Conservation. It will also be of interest to researchers of second generation biomass crops, and policy developers working in biofuel production and utilization. Michael B. Jones is Emeritus Professor of Botany at Trinity College Dublin, The University of Dublin, Ireland.